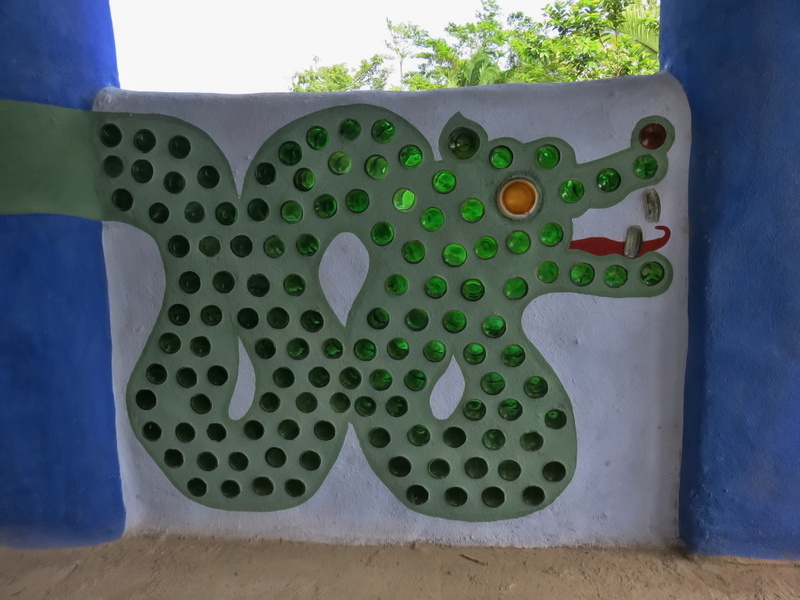 Last weekend, on the very last day of the weekend long Belize Chocolate Festival, we took a shuttle bus down the mile long path to the Lubaantun Maya Site in the Toledo District of Belize. Huge trees and greenery was pretty much all we were seeing until just before the ruins – this sign. 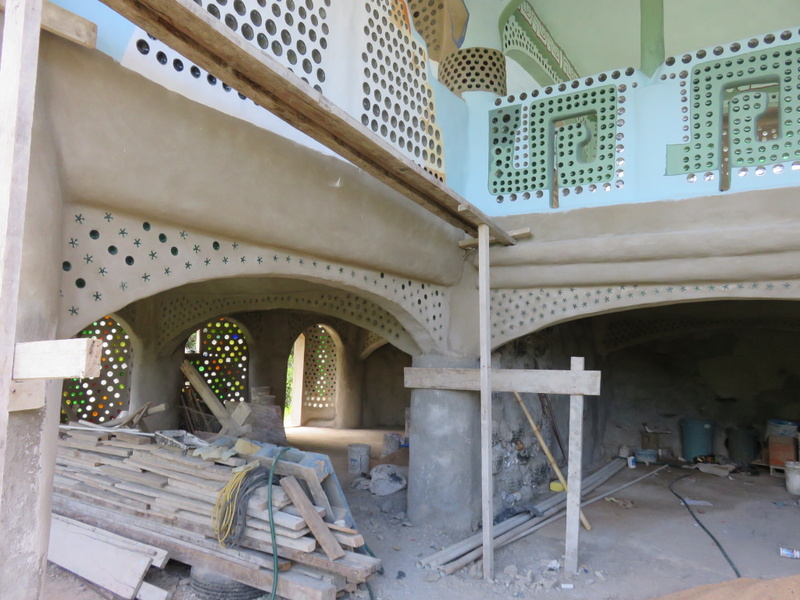 And I am certainly glad that we circled back because what I found was…well…shocking. Or at the very least very VERY surprising and actually really beautiful. 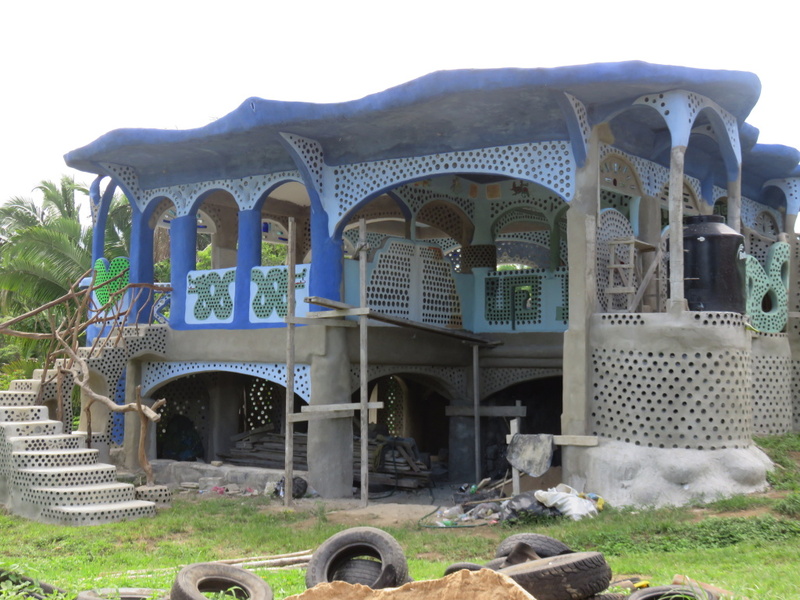 An “Earthship” made of trash and cement that almost looks like a Moorish temple or a home in Morocco or Turkey. Unique for sure. 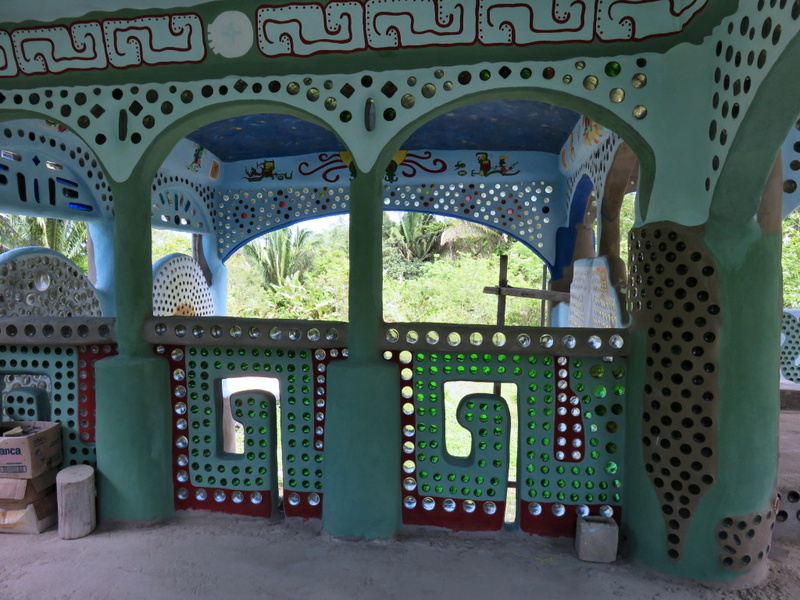 Here’s the Earthship just feet away from Lubaantun, the 1400 or so year old Maya site. 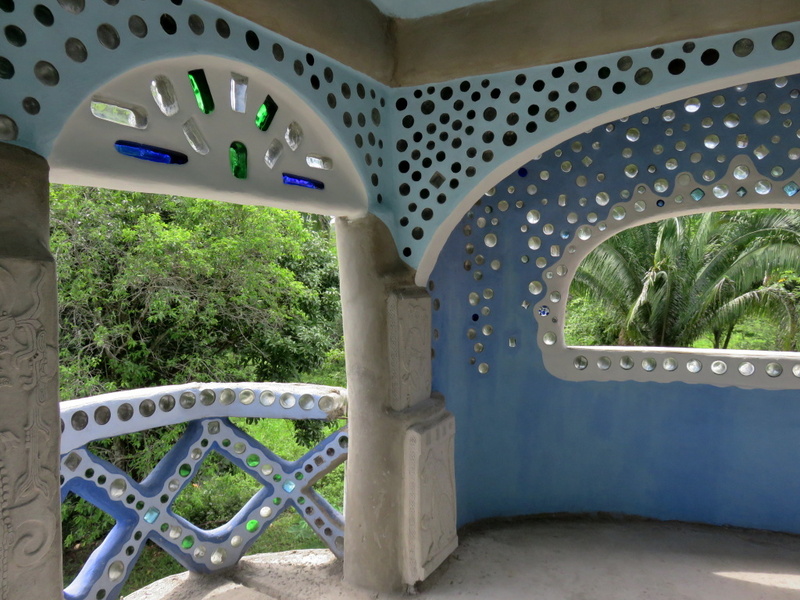 Okay…that’s not the really beautiful part. LOOK AT THE GLASS BOTTLES! 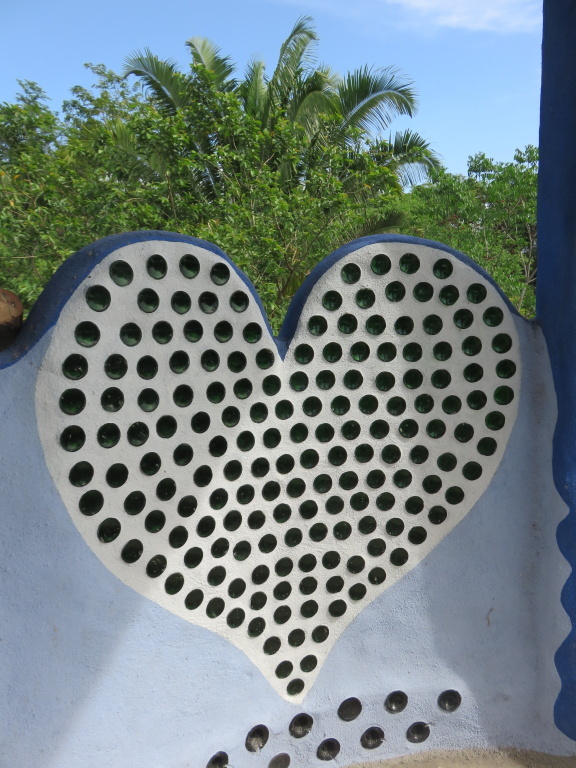 They are not just glass bottles. 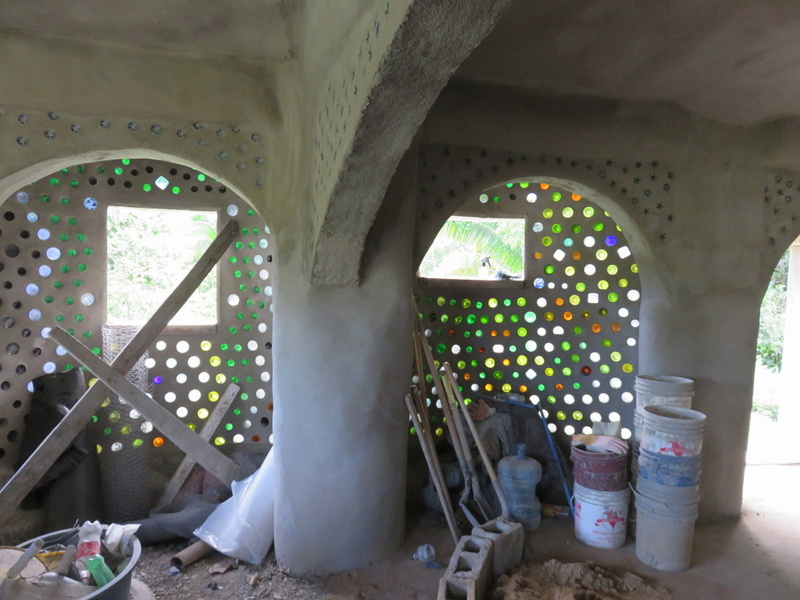 Each “brick” is two bottles…sawed in half, carefully washed and then the two bottom halves are glued together. To make the brick. The stars down at the bottom are the bottoms of plastic soda bottles. And then up the stairs. I’ll say it. OMG. 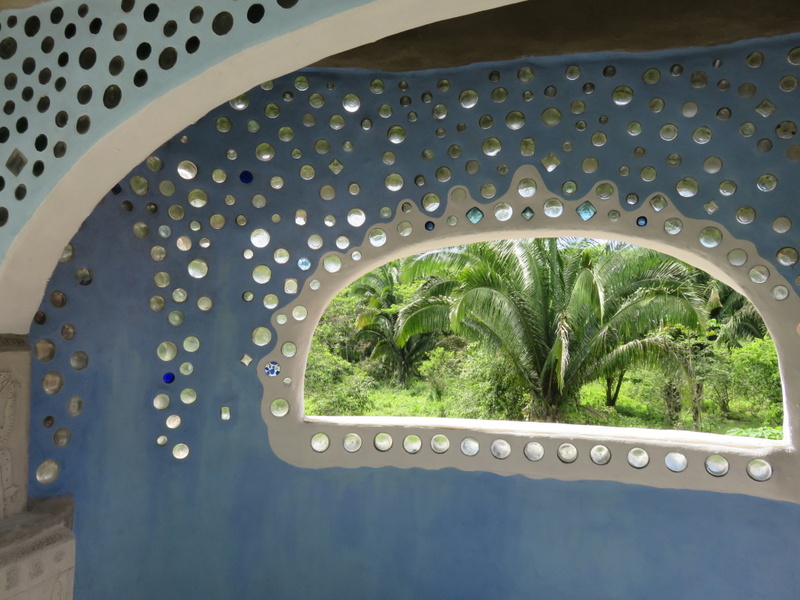 Look at this jungle framed in these gorgeous “windows”. These bubbles are just dreamy. Gorgeous. 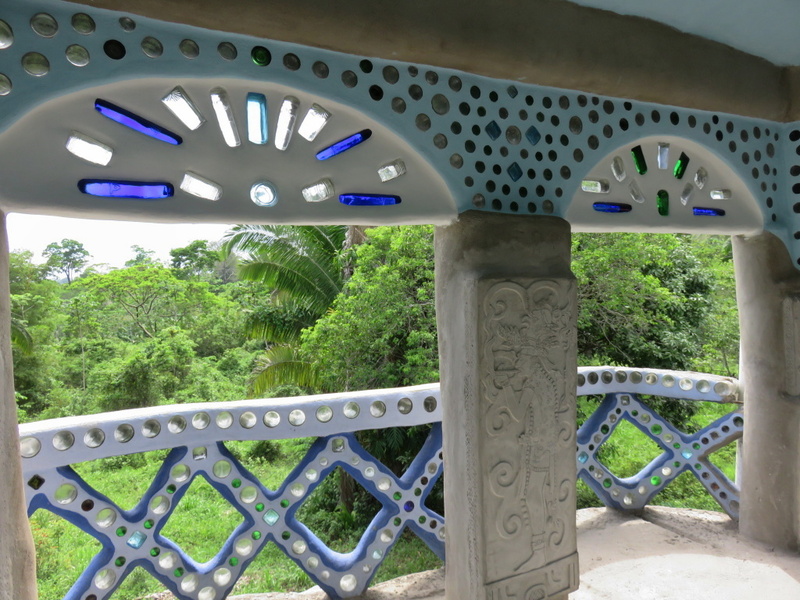 This project has taken 2 years so far…and it sounds like the entire south of Belize is collecting bottles. Bring them a crazy colored one? And I bet you’ve made a friend forever. 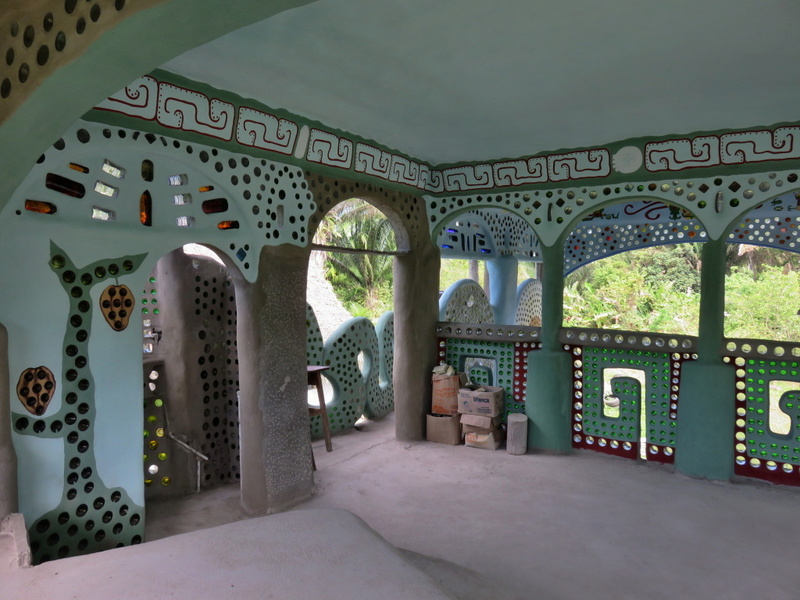 One who just happens to own an Earthship. INCREDIBLE. Totally beautiful and completely unexpected. 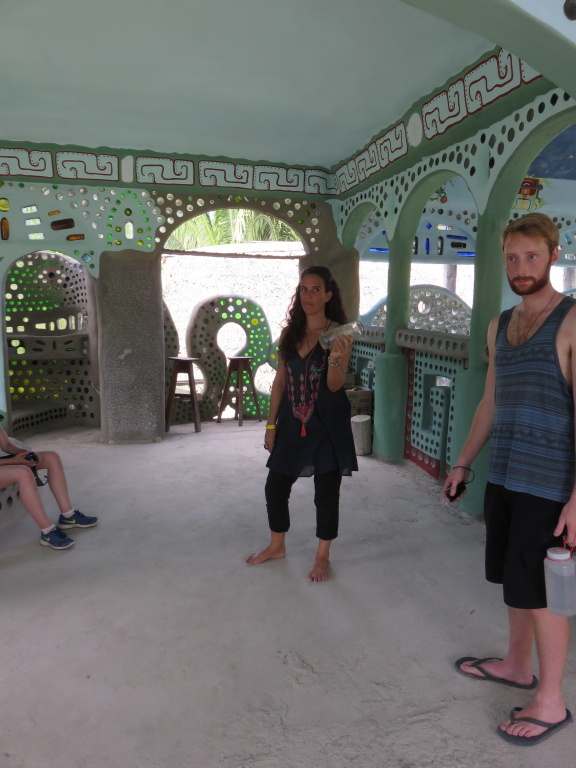 Headed to Lubaantun Maya Site, you run into an Earthship. Certainly something I had never heard of. It is pretty amazing and TOTALLY surprising. 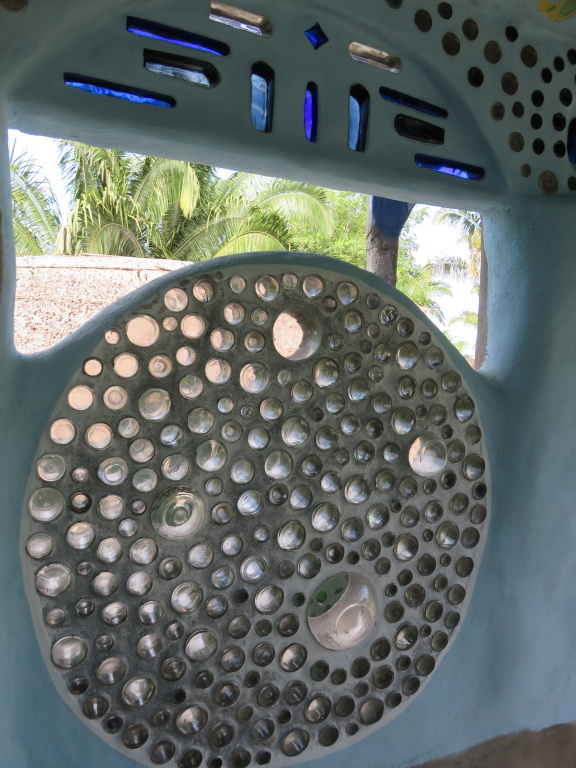 Stop in when you are down in Punta Gorda, perhaps you will also be inspired to build one. 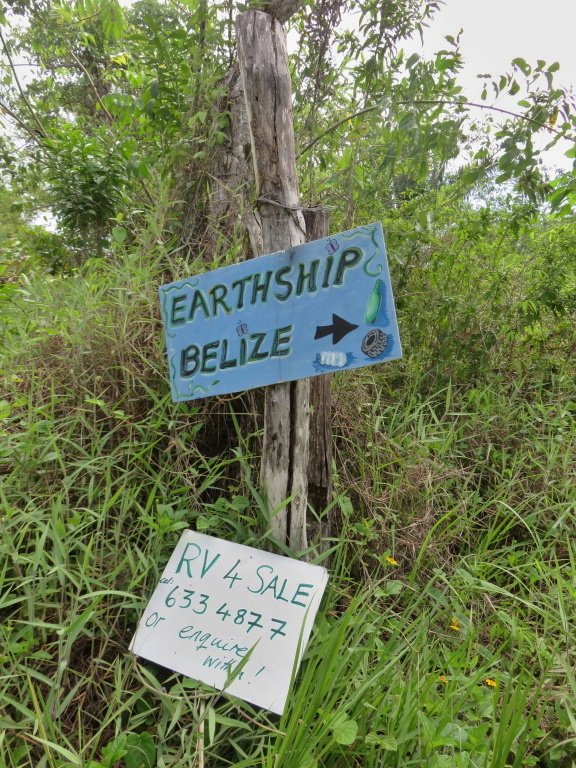 I was more hoping that an Earthship would land fully formed in San Pedro…on a piece of land that had been magically designated for me…maybe on Northern Ambergris Caye. 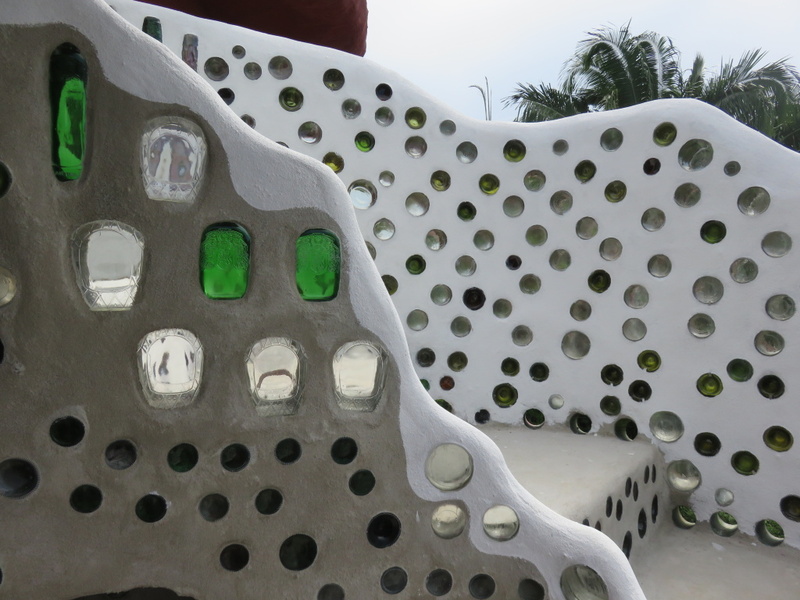 Aliens…take me to my SanPedroEarthship. 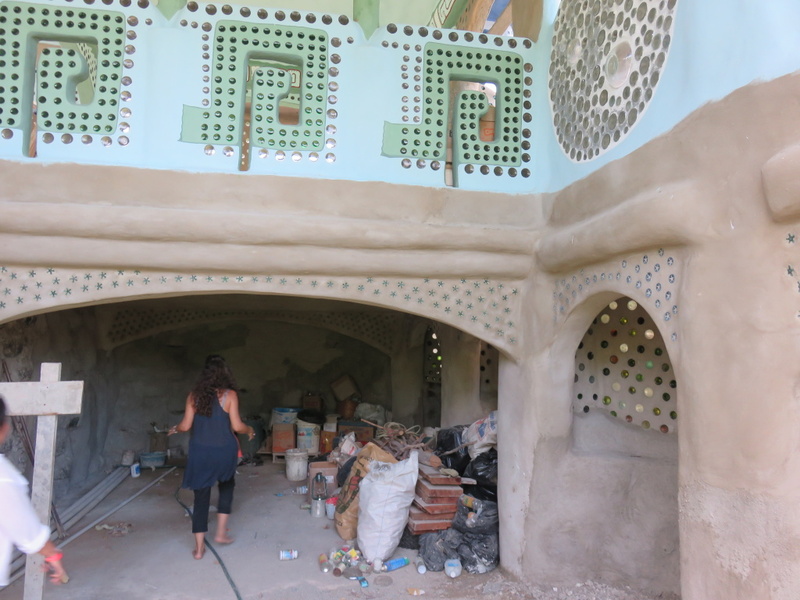 For more on Earthship Biotecture and what it’s all about, check out their Facebook page. 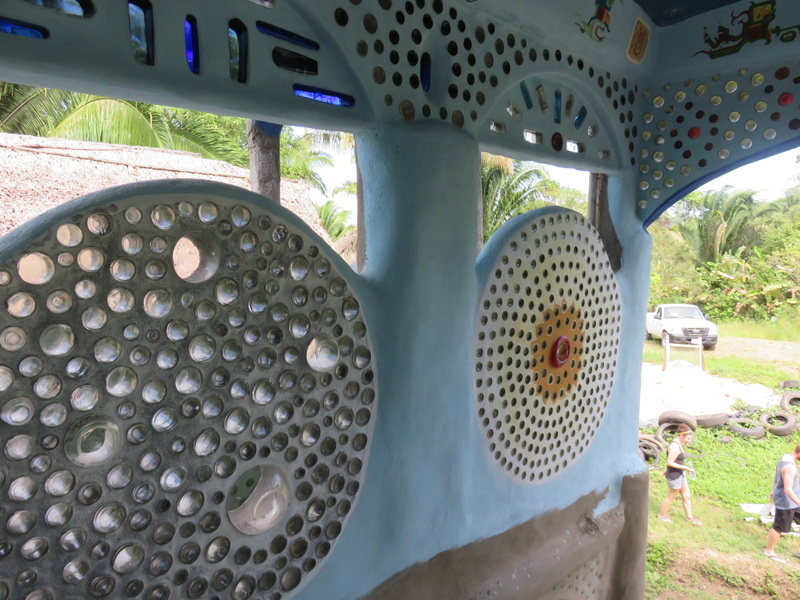 The Belize Earthship family also has a Facebook page…see their appropriately named page, The Chaos Oasis. WOW. This post gave me goosebumps. I want one too! Thanks so much for sharing your delicious discovery with us! It’s pretty gorgeous. And think of all the trash we could put to work! Just fabulous. 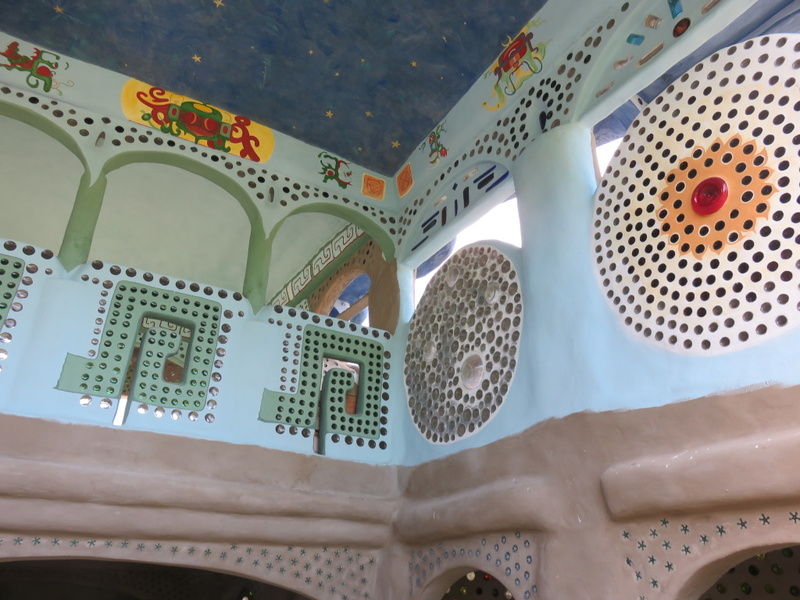 I visited the ones in Taos many years ago. I had an aching back, walked into one of these and forgot all about my back! Sat down on the floor to watch a movie and only remembered my back when time to get up. Amazingly, my back worked fine after that. Fabulous is right…I’m still left thinking how I can get one of these for my very own. There is a movie about Michael Reynolds called Garbage Warrior. My son e-d me to say they played it at MIT, which is great. I watched it, and it is hilarious. 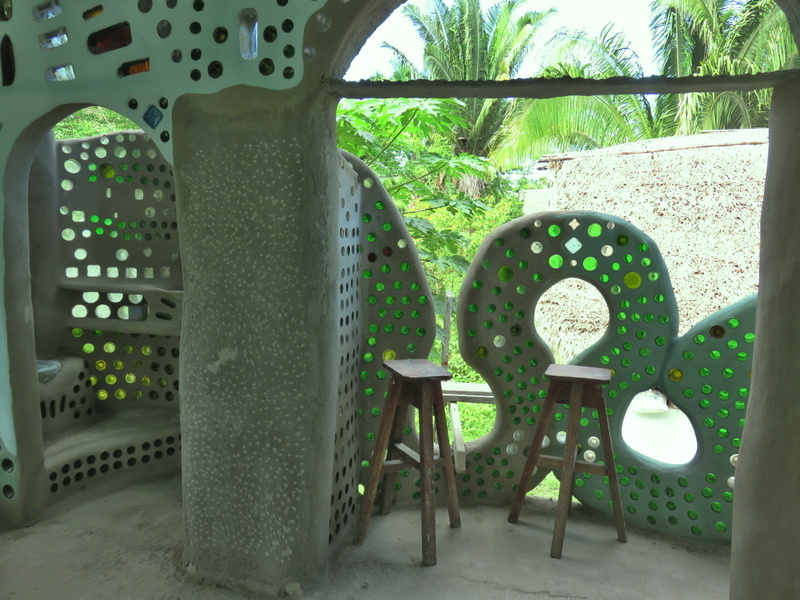 Their video on working in Haiti is wonderful also. 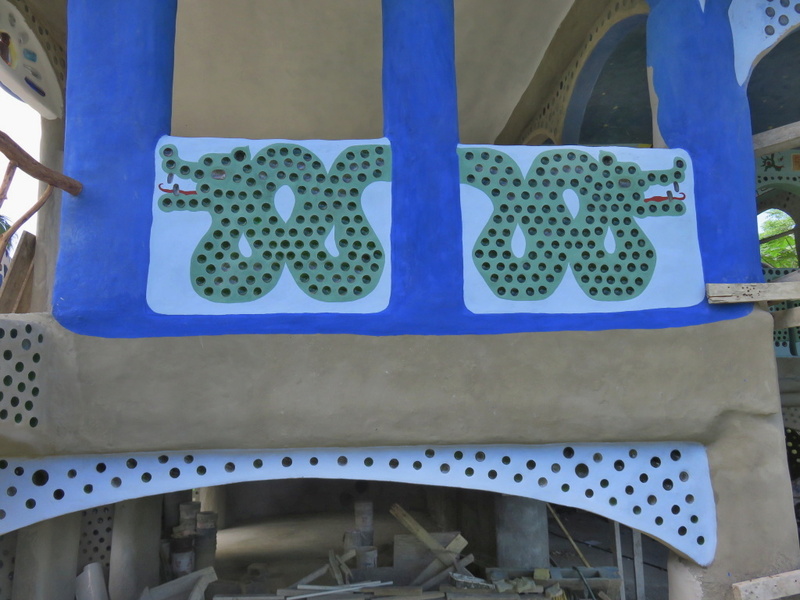 I think I found the links on the Earthships website. I SO will stop in…by the end of the year FOR SURE. I ADORE it. And have been thinking about it (strangely) lots since I was there. SO GORGEOUS. Keep it up. And…of course you are mad!